Lately we've been walking to the park before Wes goes down for his first nap in the mornings and I love this new tradition. I look forward to these walks and so does he! He sits so quietly and listens to the song of the birds and I can tell he enjoys it so much. We found a park that's a lot more hidden than the one we normally go to, and he actually plays because their aren't any kids to overwhelm him. 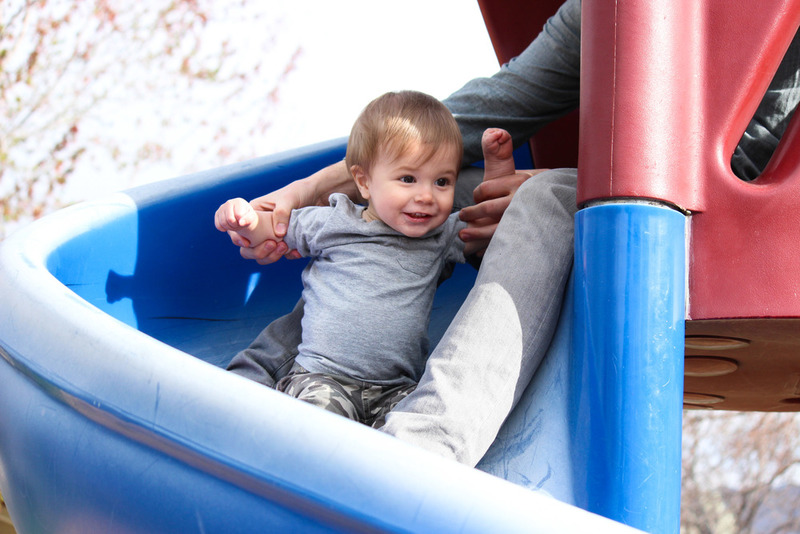 He loves the slide and giggles when he hits the bottom. Pure bliss! I was able to snap these pictures on Saturday because Darren joined us on his day off. I love watching him explore this big world and find so much excitement in the little things he discovers. Our family has been getting ready for big changes these last few months, which is another reason we are taking advantage of where we live while we can. With Darren graduating at the end of this month, we've been figuring out what our next move will be. He has worked so hard and has accomplished so much in these past few years. I'm really so proud of him! So the question is where we will be headed next! Last week a job opportunity came up that's located in New Jersey at the moment, but will then take us to Arizona by the beginning of August, which is where we originally wanted to end up. We never imagined NJ and it's all happened pretty fast, but we're really excited about it. We've pondered all of our options and really feel like the best thing for us right now and long term. We also love that we have the chance to travel and live somewhere new again, as it's always been something we've both enjoyed. Having Wes with us now makes it that much more exciting! We are grateful for these opportunities and look forward to the fun summer ahead!